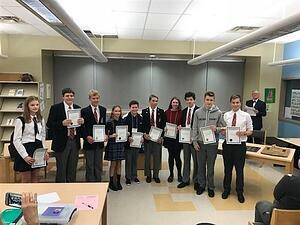 Our debating students attended a very exciting 6-round debate tournament at Halifax West last Friday and Saturday. Several of our students, both novice and experienced, were in fine form. Our debaters tackled a wide range of topics: ethics in science, space exploration, legalization of marijuana, fairness in sport and whether or not to assassinate dictators... (no comment). Overall, it was one our most successful events to date, with top 10 finishes. Alden and Luke had a 6th place team finish and 9th and 8th place individual ranks respectively. Cameron Stephens also enjoyed a top 10 individual result - finishing 3rd place overall. And it was an exciting finish, with the team of William and Cameron advancing to the final round against Fountain Academy, siding opposition team on the topic of mandatory military service, and they edged out a WIN in a 2-1 judges’ decision to take home the NSDS Impromptu Championship as well as qualify to be part of Team Nova Scotia at the British Parliamentary Nationals in Toronto in late November! Aria and Aimee enjoyed a successful first tournament, taking on some very experienced teams throughout and finishing 18th as a team. 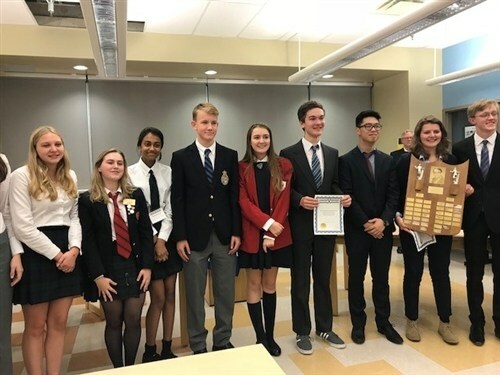 Noah and Grace also did us proud in the Senior Division, finishing 4th place as a team and also qualifying to attend the BP Nationals and Oxford Cup qualifier in Toronto in November. 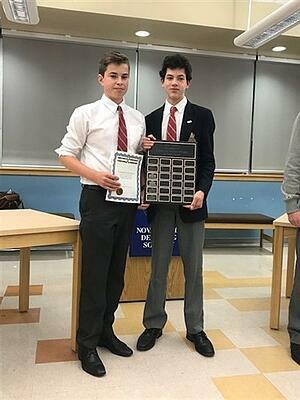 Congratulations as well to William Ahern, who, in addition to being part of the grand finale, placed 1st place overall individually, earning him the Golden Gavel Award and the honour of being ranked currently as Nova Scotia's top Junior Division speaker! 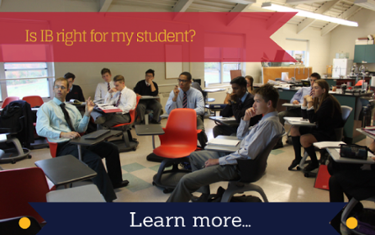 Our King's-Edgehill Invitational Debating tournament is scheduled for Saturday, November 19th from 9:00am-4:00pm.